Extremely rare & unique loft available West of Main St! Highly sought after Mount Pleasant building. This 2 bed, 2 bath, & den boasts a large open-concept chefâs kitchen, heated floors, 17 foot ceilings, floor to ceiling windows, Maple hardwood floors, gas fireplace & stove, & a huge North facing balcony with an incredible view. Quiet & extremely private with glass sliding doors that can close off the master bedroom to the below living area, plus high-end blackout shades that close with a push of a button! 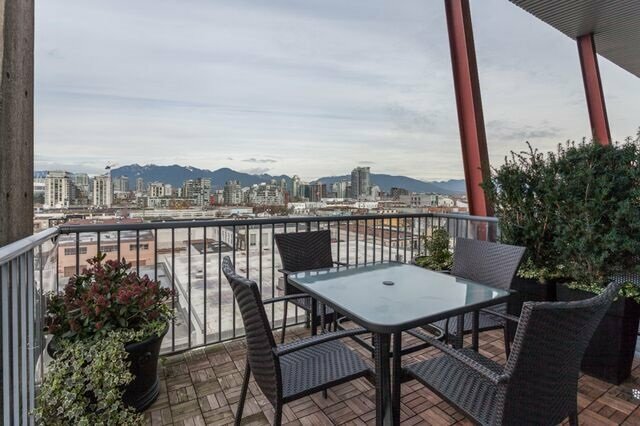 Walk 2 blocks to the Canada Line, 4 blocks to vibrant Main St, & a 5 minute walk to Olympic Village. A fabulous area with The Juice Truck, Terra Breads, Big Rock Brewery & more just outside your door step! 1 parking/storage.